A fire can devastate a business, leading to lost revenues and even permanent closure! There are over 8,000 structure fires at restaurants each year. More than 50% of these fires are caused by cooking equipment. Restaurants have all the ingredients for a fire to flame out of control, with their open flames, hot equipment, electrical connections, cooking oils, cleaning chemicals and paper products. 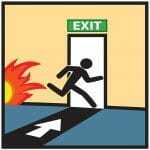 But there are ways to prevent fires and minimize the damage. Install a UL 300 Listed system. The widespread transition from animal fat to vegetable oil use in deep fat fryers means that dry chemical systems are no longer capable of extinguishing and sustaining an extinguished fire. UL 300 systems use wet chemicals which smother the fire and cool the liquids so they don’t re-ignite. Keep the nozzles of an extinguishing system covered. If they aren’t covered airborne grease can clog the hole which may impede or prevent operation of the extinguishing system. Aim the nozzles to deposit the extinguishing chemicals on the source of the fire. Install the filter panels correctly so that the grease doesn’t collect on the hood. Have an adequate cleaning schedule for the hood and vent systems. Have explosion-proof covers over lights involving high heat or high risk of fire or explosion. Make sure that the fire suppression system tags aren’t out of date. When a kitchen suppression system is serviced, a tag indicating the service date is left by the servicing company. An out of date tag indicates that the system is not being serviced regularly. Have adequate separation between open flame appliances and fryers. There should be 16 inches between the appliances or a 16 inch vertical, non-combustible (metal) divider to prevent oil from splashing or splattering into open flames. Since commercial kitchens are such high-risk environments, it’s critical that you take your fire protection seriously. 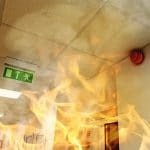 Call Fire Control Systems for fire system installation and maintenance today for your commercial kitchen.